We had a wonderful Christmas morning! 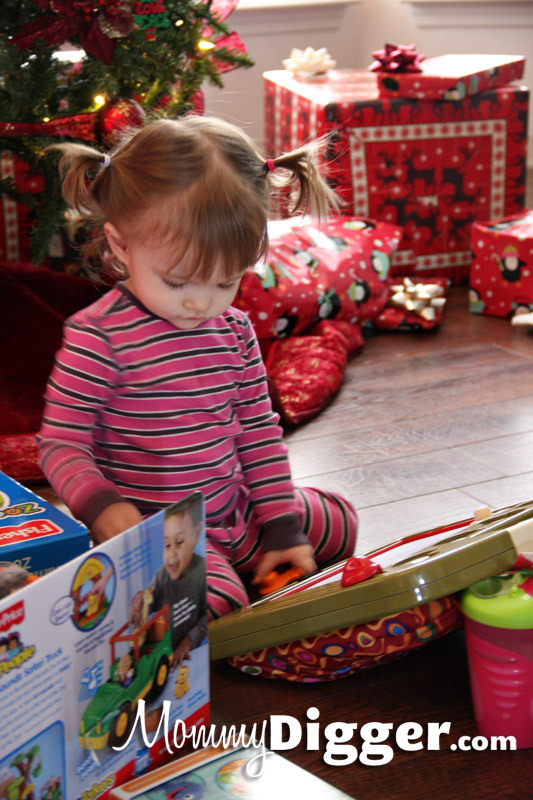 Baby Digger was really into opening her gifts in the morning, what a difference from the little baby that couldn’t walk, crawl or talk last year! This year she was running around, opening her gifts and full of excitement all day. We couldn’t get her to take a nap for the life of us! But, it was so much fun! I hope you all had a wonderful holiday and enjoy your New Year! So glad y’all are having some family time!! I know it can be hard to all get off of work! is that a magna doodle? looks like it has a lap pillow on it? I’m glad for you guys having time off at the same time and spending some family time together. I know how hard it is, my husband has gone without vacation for almost 3 years now. I am so glad you guys got some time off. Especially with the holidays, it is so nice to just have some down time and hang out as a family. I think sometimes you forget how important that is. We did some of that to over Christmas and it was so nice to reconnect as a family. Happy New Year! !